Spontaneous miscarriage refers to a clinical condition describing the loss of the intrauterine product prior to the viability of the fetus, conventionally accepted as 20 weeks of intrauterine life, or 500 grams of fetal body weight. The term habitual aborter describes a patient who serially miscarries, with three or more miscarriages being taken arbitrarily as the starting point from which a patient is labeled a habitual aborter. The exact frequency of spontaneous abortion in the general population is unknown. With the availability of sensitive beta-human chorionic gonadotropin serum assays, early pregnancies are detected that formerly were written off as simple abnormal prolongations of the menstrual cycle. Five to ten-day delays in the onset of the menstrual bleeding are very frequently diagnosed through the beta subunit as early spontaneous abortions. It is estimated today that more pregnancies are lost spontaneously than are actually carried to term. Important to mention that with age the ratio worsens and above forty it rapidly accelerates. Most of the losses above the age of 40 will have some form of chromosomal abnormality. Virginal women hardly ever miscarry their first pregnancy. Therefore, many practitioners believe that it is unnecessary to initiate a full-scale work-up after the first miscarriage. We would like to emphasize, however, that if an infectious condition precipitates the first spontaneous abortion and is allowed to persist without treatment, the subsequent pregnancies often become high risk and thus jeopardize the outcome of the fetus. The actual chance that a woman will experience a subsequent pregnancy loss once she has had two spontaneous abortions has changed dramatically during the last 40 years. In the late 1930s, the figure was a staggering 73 percent. By the mid-1970s, this number was reduced to approximately 30 to 35 percent and in our laboratory, since the introduction of aggressive antibiotic therapy, it has fallen to between 5 to 10 percent. From early 1977 we at the MacLeod Laboratory recommended antibiotic therapy for couples with one or multiple miscarriages. Most of these patients were referred to us for consultation in search of the cause of the pregnancy losses. Microbiological findings in our laboratory were the basis of my recommendations. In 1977 the use of antibiotic therapy to cure habitual abortions was alien to most practitioners in gynecology and my recommendations were received with anywhere between benign ignorance to outright critic. The standard of care in those days was either not to do anything or give fertility drug stimulation or hormonal support. Following my repeated recommendations for antibiotics some of my colleagues eventually started to turn corner. By 1983 we had follow up data on close to 300 couples who visited us for evaluation. These couples, in roughly even number, have fallen into four groups. The first group, referred to us by the most conservative doctors has not received any therapy after the miscarriage. They were reassured that miscarriages is a random event and they were sent home to try for another pregnancy. The second group received only antibiotic therapy. The third group only received fertility drug and hormone therapy and finally we gouped all couples in the fourth group who received antibiotic therapy and all the usual fertility drug regimen. The antibiotic therapy included anywhere from two to eight weeks of orally given broad spectrum antibiotics with sufficient coverage for the Chlamydia, Mycoplasma and anaerobic/aerobic bacteria groups. Often, sequentially, two to three different antibiotics were used, the choice was determined based on microbiological findings. 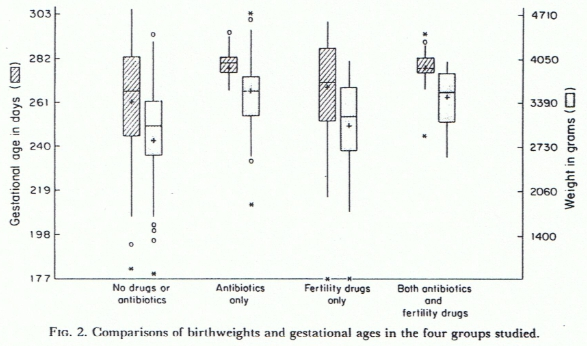 Comparisons of birthweights and gestational ages in groups with and without antibiotic therapy . The results confirmed our theory: it is an infection that is causing the real problem with recurring miscarriages. The above diagram illustrates well that patients in groups one and three and two and four performed almost identically. The graphs are almost mirror images. That means that it was the addition of antibiotic therapy that made the difference. In the groups receiving antibiotics prior to starting to try for the next pregnancy the babies were bigger and the pregnancies were delivered very close to the expected 280 ideal delivery date. Without giving antibiotic therapy, -just giving fertility drugs or not giving anything- yielded the same adverse outcome: the babies were smaller and the deliveries were scattered from very premature to post dated pregnancies. The most important result of the study was however the finding that the more antibiotics one gave after a miscarriage the better the outcome was for the next pregnancy. The higher the dose and the longer the antibiotic course was the less pregnancy, maternal or fetal complications were encountered. The chance for a miscarriage to repeat itself diminished rapidly as the dose of antibiotic increased. This study laid the foundation to the therapeutic approaches we implemented during the next 25 years. Our success in reversing primary or secondary infertility has improved precipitously as the oral therapy was replaced by intravenously given antibiotics and these results were further improved by the addition of uterine washes and the direct prostate injections. As it stands today, untimely deliveries or complicated pregnancies are events of the past. Helping somebody to a good pregnancy, a good delivery without complications for the mother or fetus is the real art of reproductive medicine. For more information see SURGERY, Gynecology & Obstetrics, September, 1986, Vol. 163, 243-250.